Most prestigious award function of the current year Cine MAA Awards 2016 has been successfully held at HICC, Hyderabad, on June 12 (Sunday Night). The event has announced Winners List and honoured them all. Here are the CineMAA Awards 2016 Dance Performance Videos Photos Live Updates. Many big celebs appeared for the occasion and sizzled the show. Megastar Chiranjeevi presence at the event made more glorious. The stage was set in to fire with energetic hosts actresses and singers. Have a look at Actor performances and their gorgeous Photos who appeared at the event. Cine MAA Awards is the most respectful award ceremony within Telugu film industry. Now the latest edition 2016 has witnessed most attractive Telugu film actors, anchors and many big celebrities. Actor turned Politician Chiranjeevi is all set to act in his 150th movie, so the Cine MAA Awards event organizers planned for a special welcome back programme initiated by MAA TV unit. At first, the organizers planned to hide the Chiru appearance at the event, but Chiranjeevi’s rehearsals on the set leaked the news. Maa channel associates launched e CineMAA Awards in 2004, so Movie Artists Association (MAA) Awards are to honour artistic and technical brilliance across Telugu Cinema. CineMAA Awards Winners will be selected based the votes of both the public and a committee of specialists. CineMAA Awards will be aired on Maa TV in next month. 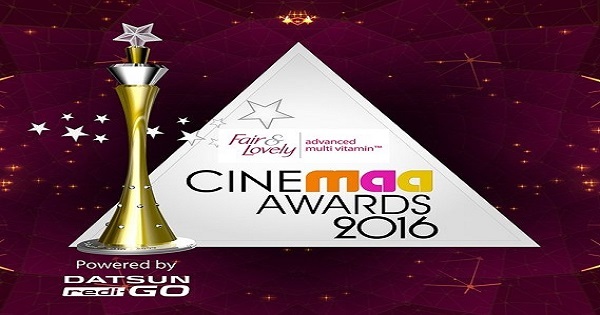 Here are the Live Updates of CineMAA Awards 2016 Full HD Video Highlights Actors Dance Performance Videos Photos. Coming to the CineMAA Awards 2016 Winners List, Baahubali won the Best Film award, while Jr NTR was honoured with the Best Actor award. 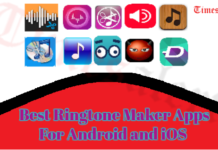 Moreover, Baahubali also won many awards in technical categories that include music, singers, etc. Koratala Siva received Critics award for his excellent direction in Srimanthudu. 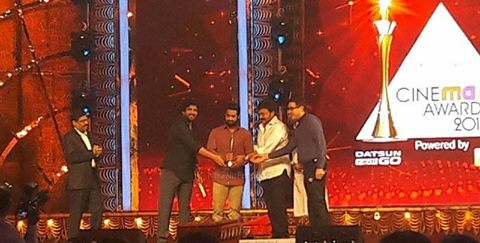 Best Film Award from Critic’s choice also received by Srimanthudu. Megastar Chiranjeevi and Nagarjuna honoured the Best Actor Award grant to NTR Jr for his dashing performance in Temper. Best Actress in the popular category was given to Anushka for her brilliant performance in Gunasekhar’s Rudhramadevi. Allu Arjun was honoured with Critics Award for his splashy performance as Gona Ganna Reddy in Rudhramadevi.